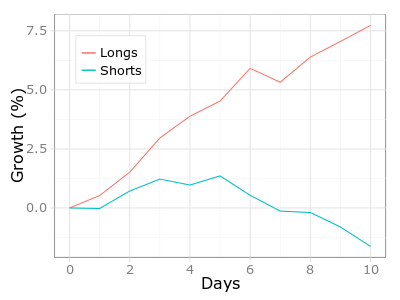 The chart shows the average return x-days after an entry. It conveys the expected average returns for an individual trade. 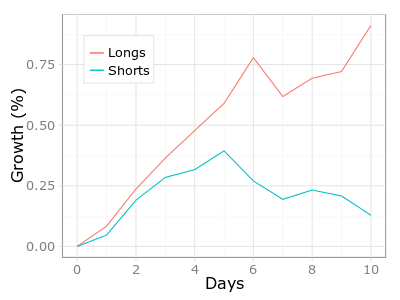 As we previously found out, short positions tend to deteriorate with time. This chart however reveals the peak – achieved at about 5th day into the trade. Hmm, can we benefit from a limit on the maximum number of days into the trade? It’s worth looking at the same chart but using volatility adjusted returns. Just to make sure that the volatility is not skewing the mean. Very elegant IMO, but isn’t that almost always the case with R? If you are often dealing with time series – notice the use of lag.xts. IMO it’s worth understanding why I prefer lag.xts over lag. Leaving it to you. And if you are looking for a good read on trading system development, I’d strongly recommend Keith Fitschen’s Building Reliable Trading Systems!